Jose Mourinho and Paul Pogba of Manchester United. France coach Didier Deschamps believes Paul Pogba’s reported feud with Jose Mourinho has been blown out of proportion. 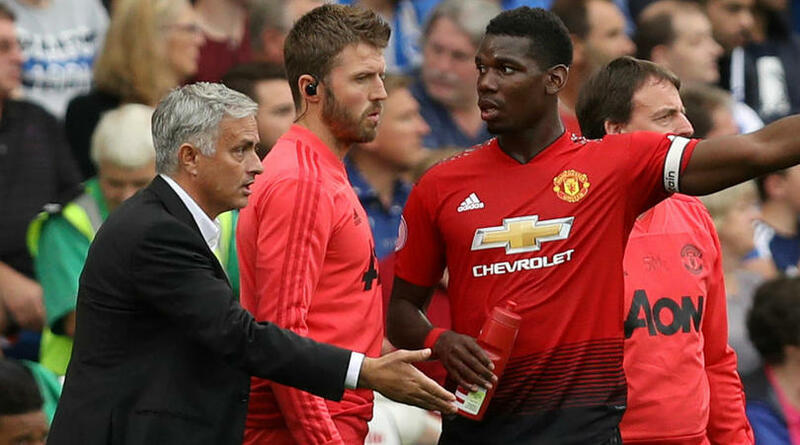 Although Pogba has netted four goals in all competitions this campaign, he was stripped of the vice-captaincy by Mourinho, who denied a training ground row between the pair, while the midfielder claimed he was banned by the club from speaking to the media after last week’s goalless draw with Valencia. Pogba – who was named in the 30-man Ballon d’Or shortlist on Monday – is now on international duty for a friendly against Iceland and a Nations League clash with Germany, and Deschamps believes reports of a feud between his influential midfielder and Mourinho have been exaggerated. Speaking at a media conference, Deschamps said: ‘I think it’s exaggerated. Maybe you didn’t watch their last game [a 3-2 win over Newcastle United], because I witnessed a great Paul Pogba. ‘I think Jose saw the same thing as me. Some things happened and I think that, like is often the case, we make a big deal of something that isn’t. ‘It’s true that there are some facts and some may have jumped to certain conclusions. When I see how Paul behaves towards the situation at his club, some may say he’s done everything he could possibly do mentally and when it comes to his individual performances, to help the club.